Typhoons that hit Hokkaido last August have resulted in a domestic spud shortage for Japan. Know what fewer potatoes means? Fewer potato chips. And like that, the panic buying has begun. 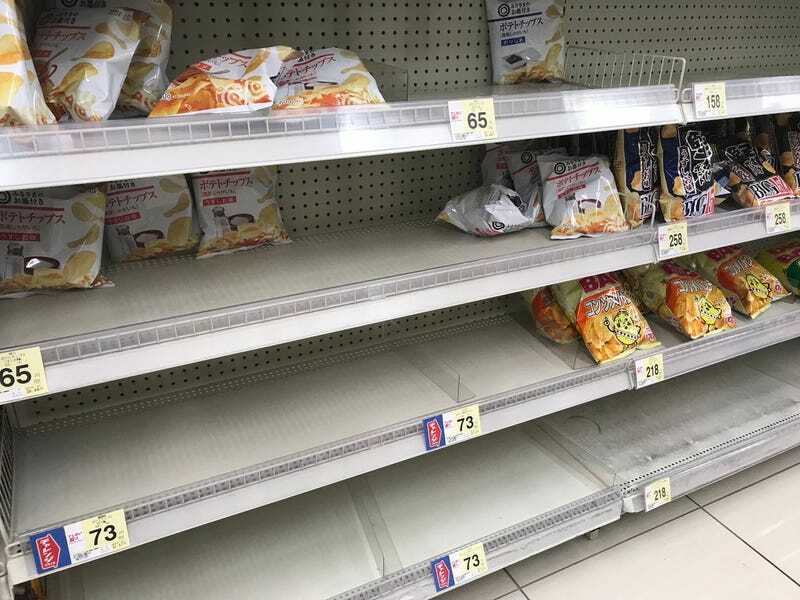 According to Jiji, Japanese snack companies Calbee and Koikeya are ceasing the sale of numerous potato chip products because of this shortage. Japan Today reports that starting April 15, Calbee will no longer ship 18 potato chip snack varieties, and from April 22, it will temporarily suspend 15 more varieties, including its Big Bag Lightly Salted, which might be the country’s most iconic potato chip. Calbee was hoping to use American imports during the shortage, but apparently cannot meet demand. Japan Today adds that Calbee also said American potatoes aren’t up to snuff quality-wise. Koikeya, meanwhile, is temporarily discontinuing nine of its potato chip varieties, citing the fact the company uses 100 percent Japanese spuds. Not all potato chips are disappearing from Japan. However, because the sale of certain popular varieties are either ceasing or stopping temporarily, stock is already vanishing from certain store shelves. Note: This isn’t happening everywhere (for example, as of earlier today, this store and this one seem to be stocked), and like I said, it’s not happening to all types of chips. The brand that appears to be hit hardest is Pizza Potato, which is one of the varieties Calbee will no longer make. Like clockwork, bags of Pizza Potato are also appearing on Japanese internet auction sites. I went to five different stores tonight in Osaka, and I can confirm that, yes, specific varieties impacted by this are in short supply, if not selling out. As you can see some people are buying lots of these endangered varieties. Or recommending that you buy before they’re gone. Here are photos of the situation from across the country. Some stores are cleaned out.